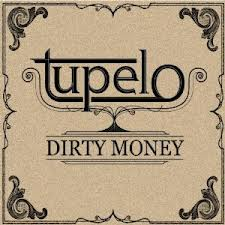 Take the explosiveness of Usain Bolt and the sustainability of Mo Farah, and you start to get the feel for the pace of this fourteen track debut album, titled ‘Dirty Money’, from five-piece Dublin based band, Tupelo. The acute blending of traditional Irish and Appalachian music, all delivered at a frantic speed, enables the guys to hurtle through a set of songs designed to remove any evidence of lethargy from a listener rooted in observing the athletic activity from East London. Apart from a touch of nationalistic respite in the middle of the album, where the band adopt an anthem-like approach with a tribute to their 1916 fallen compatriots in ‘I’m an Irishman’, the continual stream of toe-tapping fiddle led tunes dares anyone to remain seated until they ease up with the finishing line in sight and a slow tempo final number, ‘My Family’s Land’. The band led by lead vocalist and multi-instrumentalist James Cramer will no doubt attract comparisons with that other ‘quite famous’ group featuring the enigmatic Shane McGowan who infiltrated the mainstream by serving up a fast diet of frenzied Irish music in the late 80’s and early 90’s. Yet this album has a greater hint of Americana influence in the sound with many of the songs not being out of place in a rural Appalachian hoedown setting. The driving double bass of Damien McMahon helps maintain a tempo to support the diverse string work of Paul Murray and fiddle playing of Kevin Duffy while the Alto, Baritone and Tenor saxophone input from Tim Condron gives a more rounded and eclectic presence to many of the songs. There is a plethora of feel good relentless paced tracks either side of their mid album salute to the past with the title track ‘Dirty Money’, ‘No No Doctor’ and the simple straightforward sing along chorus to ‘Figure It Out’ all being memorable highlights from the first batch of songs. Following the pivotal ‘I’m an Irishman’ track, which is due to be the third single lifted from the record, exists a trio of songs that take the album to new levels as the band’s transatlantic influences come to the surface. ‘Railroad’, probably the highpoint of the record, is a throwback rural bluegrass number that can’t fail to impress with top banjo and fiddle input while its follow up 2:07 minute long reprise is a harmonica laced - blues tinted number that demonstrates the band’s versatility and respect for roots music. The positive vibes emanating from ‘Blue Gardinia’ are enough to want you to seek the place out – real or fictional. It may have taken Tupelo a few years since their 2008 inception to produce a full length release but the experience gained from constant touring has figured strongly in its sound. Their stock in Ireland has been in the ascendancy for a while now including an appearance in front of 80,000 at the All-Ireland Hurling Final and they have an exceptionally high quality and enjoyable batch of songs to expand into the UK during this busy summer of 2012.